Left: Azerbaijan International's cover in September 1993 focusing on the alphabet transitions from Cyrillic to Latain. If alphabets could speak, they would tell you that much more goes into their design than just aesthetics. Historical precedence, religion and politics all play an important role in their final shape. Azerbaijan's new Latin alphabet is no exception. On December 25, 1991, Azerbaijan's Milli Majlis (Parliament) officially adopted a modified Latin script for their Azeri alphabet. It was one of the first decisions of the new Parliament-and one, needless to say, that met with immense controversy. Alphabet changes are not new to Azerbaijan; this was the fourth time this century it had been changed. Latin replaced Arabic in 1928, followed by Stalin's imposition of Cyrillic in 1938, which remained until the collapse of the Soviet Union in 1991. No matter how revolutionary and daunting the task, it was not a new idea. In fact, if you count the slight modifications and "corrections" that have been made to individual letters in both Latin and Cyrillic during this century, then there have been at least 10 occasions when the alphabet has been changed. By the early 20th century, the Arabic alphabet had been in use by Azerbaijanis for more than 1,000 years. Unfortunately, this script could not express the nuances of sounds in the Azeri language. So by the late 19th century, the question of alphabet change became a major topic of discussion among the intelligentsia. Writer and playwright Akhundzade (who died in 1878) advocated for change as did Jalil Mammadgulzade, editor of the satiric magazine, "Molla Nasraddin, " in the early 1900s, but both of these reformers were severely attacked by the clergy. In 1918, the question again arose with the establishment of the Democratic Republic of Azerbaijan. However, this government was so short-lived (only 23 months) that it did not have sufficient time to resolve the issues of the alphabet change. In 1920, the Bolsheviks took power and pressured for Latin. Latin was beginning to be used simultaneously with Arabic. For example, the newspaper "Yeni Yol" (New Way) used Latin exclusively. Above: First alphabet primer by Yahya Karimov, introduced in 1992. In 1924, Nariman Narimanov, a leader in the Bolshevik government that was set up in Baku, succeeded in passing a resolution for all official documents to be written in Latin. In 1926, the First Congress on Turkology was held in Baku, and scholars from all over the world participated. At this conference, the conclusion was reached that, given the sound patterns in the Turkic languages, Latin was the optimal alphabet to express these sounds. Ataturk began a successful alphabet reform in Turkey in 1928, replacing Arabic with a modified Latin script which is still in use today. In 1928, a committee known as "Yeni Alif" (New Alphabet) was established in Moscow to deal with alphabet issues, and that same year, Latin was adopted for all the Turkic people of the USSR (Azerbaijan, Turkmenistan, Tajikistan, Kazakhstan, Kyrghyzstan and Uzbekistan). At that time, the alphabet was sufficiently standardized among these Soviet-Turkic languages to facilitate communication. Such legislation fostered the cultural union of the Turkic people. Sketch by Gunduz. New Latin Alphabet. Quote says: "Who does he think he is: trying to look so different?! Sketch: There are a few inconsistences in the shapes of some of the letters chosen for the Azeri Latin script. For exmpal, the "upside-down e" is a "misfit." To be consistent with other vowels of the alphabet, it should have two dots (an umlaut) over it. However, since this sound /ae/ like the "a" in "fat cat" is one of the msot frequent in the Azeri language. As people didn't want to have to deal with so many dots. Hence, they reverted to the earlier pattern of the "upside-down e."
But by the late 1930s, Stalin sensed that these Turkic-speaking nations could threaten Soviet power if they united. To eliminate such a possibility, he rescinded the Latin alphabet policy and forced all Turkic people to adopt Cyrillic (1939-1940). Moscow further confounded the possibility of their communicating with each other by assigning different characters for the identical sounds in their languages which did not exist in the Russian language. For example, there were seven different letters created in Turkic Cyrillic scripts to represent the one sound /ng/ that is found in the word, "English." So it became nearly impossible for readers of these related languages to communicate with each other through the written word. Sketch: A joke circulating at the turn of the century. Many people regarded Arabic as very time consuming because there were so many dots. For example, the word, "panjshambeh", the word for "Thursday", required 10 dots. Thus, for many Azerbaijanis, reclaiming the Latin script in 1991 symbolized the restoration of a heritage that had been stolen from Turkic-speaking people under Soviet rule. In the 1970s and 1980s, a group of Azerbaijani writers including Anvar Mammadkhanli, Ilyas Afandiyev, Aydin Mammadov, Akram Aylisli, Elchin, Vagif Jabrayilzade and Mati Osmanoglu occasionally raised the issue of reclaiming the Latin alphabet in their speeches and written works. The movement for the revival of Latin became quite pronounced after January 19, 1990-referred to in Azerbaijan as "Black January"-when Soviet troops descended with their tanks and killed innocent people on the streets of Baku. Moscow feared Azerbaijan's growing independence movement and wanted to crush it. According to Firidun Jalilov, a Turkologist who helped spearhead the Latin movement, a great depression descended on the people after the "Black January" events. It was so incomprehensible and shocking that tanks from their own country, the Soviet Union, had descended upon their own city and killed innocent bystanders who happened to be in their path. Officially, 132 people died that night. Unofficially, the figures are much higher. 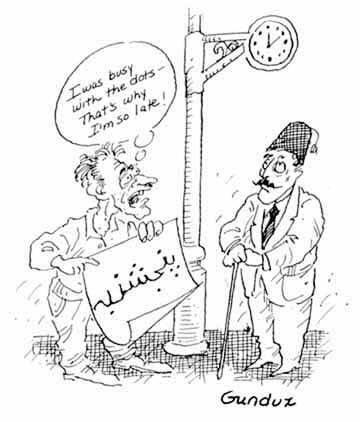 Sketch: The Arabic alphabet cannot distinguish all the sounds in Azeri. An anecdote is told how a villager received a note from someone in a distant village. But he didn't know whether to send his congratulations or his condolences. 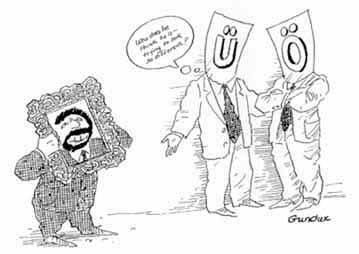 He couldn't tell if a child had been born (oldi) or someone had died (üldi). According to Jalilov, "We needed something to spur us on, to unite us in our quest for independence after this great tragedy. That's when some of my friends, like Sabir Rustamkhanli and I came up with the idea of pursuing one of two possibilities-either starting a campaign to rid ourselves of the Cyrillic alphabet or finding a way to modify our Russified last names." [This refers to dropping the Russian suffix -ov, -ova, -yev or -yeva which had been imposed everywhere during the Soviet period, and replacing it with Turkic endings, especially -zade, -li and -qiz]. Jalilov concluded that the bureaucratic procedure needed for changing surnames was too cumbersome and would require considerable time, energy and money. So he and his friends decided to push for adopting the Latin alphabet! In March 1990, Jalilov published a newspaper article about the alphabet in the newspaper "Azerbaijan," which at that time belonged to the opposition (though today it is the main government newspaper). This generated a strong reaction. Many other articles and discussions followed. 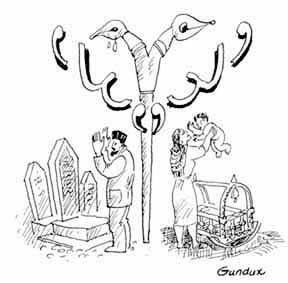 In addition to Latin, Cyrillic and Arabic, even Old Runic (an alphabet of the 7th and 8th centuries) was discussed as a possibility, Latin, however, generated the most interest. Parliament's efforts to adopt the Latin alphabet were met with great resistance particularly by those opposed to Azerbaijan's independence movement. So many confused ideas were circulating about scripts and languages. Some argued that adopting the Latin alphabet would cause Azerbaijan to become dependent on other nations, meaning Turkey, Europe and the West. Some even suggested that the Azeri language would be absorbed into Turkish and disappear shortly afterwards if it were changed. Some religious leaders claimed that the Arabic script was "the alphabet of Islam." With financial backing from neighboring countries, they began setting up coursed to teach the Arabic script in secondary schools and privately. This campaign continued until 1993-94. This confused some people into thinking that, by learning the Arabic script, they would be able to understand the Arabic language. Others feared that when symbols for specific letters changed, the sound would change, as well. However, when pro-Arabic contenders saw that their arguments were being refuted scientifically and they were losing the debate, they united with pro-Cyrillic forces against those advocating Latin. One of the most ardent anti-Latin forces in the country was the Azerbaijan Social Democratic Party. It should be noted, however, that both Presidents Abulfazl Elchibey and Heydar Aliyev were strong advocates for the new Latin. The government was supported by the foremost linguistic institution and by individual professional linguists such as Tofig Hajiyev, Firidun Jalilov, Kamil Vali Narimanoglu, Suleyman Aliyarly, Sabir Rustamkhanli and others, all of whom published numerous articles arguing that the Latin alphabet was the most suitable for representing all Azeri-specific sounds. The transition from Cyrillic to Latin has been rather slow. First graders received their Latin alphabet primers in September 1992. In fact, in order to print enough texts, the youth magazine "Ganjlik" sacrificed its August 1992 issue so that the press could run the textbooks instead. Later the same year, Yahya Karimov's primer "Alifba" came out in Turkey and was brought to Azerbaijan. Since then, all newly-printed textbooks and other teaching materials for schools have been printed entirely in the Latin script. For example, although old Cyrillic textbooks are still used in upper grades, the new ones are in Latin. Each year, the textbooks for the next higher level are printed in Azeri Latin (the project has reached the fifth level now). This means that students in the junior grades are not even familiar with Cyrillic and that Latin is their native alphabet. More visible progress can be seen regarding the Latin alphabet this year. On more than one occasion, President Aliyev has focused his speeches on both the importance of the Latin script and of strengthening the role of the Azeri language as the national language, in general. Another first since the adoption of Latin: the Speaker of the Milli Majlis, Murtuz Alasgarov, officially stated in Parliament (April 1997) that the implementation of the new alphabet should be accelerated nationwide. Following his statement, leading national papers ("Khalg Gazeti" and "Azerbaijan") have begun to print presidential decrees and parliamentary news (which is sometimes a major article) in Latin. No longer does AzTV (Azerbaijan TV) use the apostrophe when presenting Latin. The apostrophe was left over from Cyrillic (from Arabic) but is no longer used now in Latin. Now, that too has been removed at least in popular usage on television. People are becoming more familiar with what Azeri Latin looks like. For example, in May 1995, one company had translated 40 pages of text and documents and taken them to a Notary's office for certification. After looking at both the English and Azeri Latin copy, the Notary handed them back, demanding that they both be translated, as they were both written in a foreign language. More and more books are being published, though the process is still extremely slow. There are story books and folktales for children. some of the more recent publications include two volumes of Fizuli's poetry, a folklore anthology entitled "Azerbaijani Customs and Traditions," Aziza Jafarzade's new novel "Zarintaj Tahira," Vahid's gazelles (a form of poetry) and a few scientific books. Still, Cyrillic is primarily the alphabet of publishing. Sometimes the cover is printed in Latin, but the contents inside are Cyrillic. The growing computerization of the country. The enthusiasm for learning English. The new alphabet is seen as a means to facilitate learning it. The government's use of the Latin alphabet in official documents. Also TV (which is state-owned) is playing a major role in this process, as well. Written text on TV has been exclusively in Latin since 1992. The desire to integrate into the global community as quickly as possible, influenced by the number of Westerners who are living and working in Azerbaijan. The growing understanding that the new alphabet is the most reliable means to unite with other Azerbaijanis (as well as with other Turkic-speaking nations) around the world. Although Azerbaijanis in Iran use the Arabic script, many are familiar with a Western language in the Latin script. Azerbaijanis in the North and South have more common ties through the Latin script rather than Cyrillic. The appearance of Latin headlines in newspapers and billboards. The support of the older generation who studied Latin in school when they were young. All of these factors support the belief that the Latin alphabet is establishing itself in Azerbaijan, not necessarily as rapidly as some might wish, but steadily and irreversibly. Firidun Khalilov and Jala Garibova contributed to this article. From Azerbaijan International (5.2) Summer 1997.